The next construction stage of Hapag-Lloyd Cruises’ Europa 2 began with her keel laying today at the STX Europe shipyard in St Nazaire, France, with the lowering into the dry dock of new ship’s first block. Sebastian Ahrens, managing director of Hapag-Lloyd Cruises and Laurent Castaing, general manager of STX France, each placed a coin on the block. The coins were welded into the block and will accompany the ship on all her future voyages. This tradition is believed to bring good luck to new ships. The first block has a length of 11.8 metres and is 8.6 metres high and weighs 400 tonnes. Concurrent with the start of construction in the dry dock, thenew ship’s suites are being manufactured in the shipyard’s cabin factory. 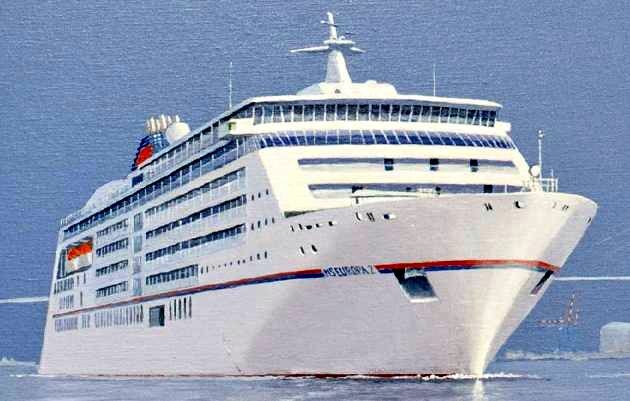 Then, at the beginning of July, the Europa 2 will take to the water for the first time so that work on her interior can be initiated at the outfitting pier. A total of 835 shipyard workers are involved in the construction of the new ship. Until delivery in the spring of 2013 the shipyard workers will dedicate over 2.5 million hours of labour to the project. For more information on Hapag-Lloyd Cruises’ exciting destinations and itineraries visit www.hl-cruises.com. For bookings, enquiries or brochures please call Gay Scruton at The Cruise People Ltd in London on 020 7723 2450 or e-mail cruise@cruisepeople.co.uk.